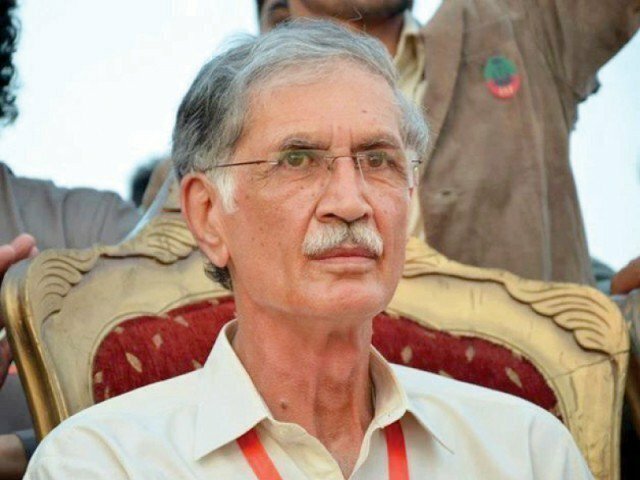 PESHAWAR: Chief Justice of Pakistan Mian Saqib Nisar on Thursday reprimanded Khyber Pakhtunkhwa (KP) Chief Minister Pervez Khattak over the provincial government’s inability to provide potable water to citizens and ill-disposal of sewage and industrial waste. The chief justice who has been taking keen interest in public related issues, particularly better education and healthcare, has visited Peshawar this time after taking up similar suo motu cases in Punjab, Sindh and Balochistan. During his visit, the CJP ordered the KP chief minister to appear before a three-member bench, headed by CJP and comprising Justice Mansoor Ali Shah and Justice Umar Ata Bandial, at SC’s Peshawar Registry to clarify the government’s shortcomings pertaining to these issues. During the hearing, the CJP asked the CM to explain why there has been no improvement in the state of affairs of the province despite being in the government for more than four years. “I have visited the Lady Reading Hospital (LRH) earlier in the day but observed no improvement in the state of affairs there,” the CJP chided. “Do you know how much waste is flowing into the streams of the city?” he flayed Khattak, who responded with silence. Echoing his earlier remarks made in reply to the prime minister’s criticism of judiciary interfering in the executive matters, the CJP said it was the “judiciary’s job to satisfy public as executive has failed to do so”. In an apparent reference Nawaz Sharif’s ‘honour the vote’ drive, the CJP told the Pakistan Tehreek-e-Insaf (PTI) chief minister that the ‘real honour’ lies in serving the public. Pointing out the PTI-led KP government’s tall claims, the CJP questioned the CM about the “number of hospitals and schools constructed during the last five years of his government” and added that “it was not a short amount of time”. Responding to the CJP’s criticism, the chief minister tried to shift the blame on previous governments, saying: “The structure of schools and hospitals were in shambles when the PTI came into power; however, the KP government has improved things to a large extent. “You would have seen [how bad the situation was] if you had visited four years ago,” he said, adding that the results of his administration’s educational and other efforts will become apparent 4-5 years later. Not convinced by the CM’s arguments, the CJP said he had faced “hopelessness” from all sides and added that he was well aware of “Peshawar being cleaned up just a week ahead of his visit”. Earlier in the day, Justice Nisar lashed out at provincial officials over “no clean drinking water in the province”. Justice Nisar took KP Chief Secretary Azam Khan to task when he informed the court that sewerage water is dumped into canals and rivers. “You say everything is good here… what else is ‘good governance’?” he quipped. “Which canal are you throwing Peshawar’s filth into?” he inquired and questioned why there was no dumping ground in the city for the particular purpose. During a hearing of a case pertaining to disposal of hospitals’ waste, the CJP asked the health secretary about conditions of KP hospitals. The secretary disclosed that a total of 1,570 hospitals are present in the province while two districts lack a district headquarters (DHQ) hospital. On the court’s orders, the secretary submitted a report about the process adopted by the government to dispose of medical waste. The CJP also heard a case about excessive fees charged by private medical colleges in the province. Al-Razi Medical College’s officials apprised the court that the students were being charged Rs800,000 fee per year. However, a student present in the court contradicted the claims and informed the court that the college was charging Rs1.2 million and presented receipts to corroborate his claim. He ordered the college to return the extra fees charged to students on an immediate basis and ordered authorities to seize the college’s records and freeze its assets. Justice Nisar later also visited Al-Razi Medical College, where he interacted with students and observed the facilities. Separately, the CJP ordered that all additional security protocol granted to “unentitled persons” be withdrawn while hearing a case pertaining to case about the deployment of security personnel in the province. The CJP ruled this after the KP police chief Salahuddin Mehsood told the court that at least 3,000 security personnel were currently deployed for personal security throughout the province. He ordered the KP police chief to withdraw all police personnel deployed for the security of officials by tonight, saying that those “possess everything can arrange their personal security as well”. The IG assured the court that the same will be done by the evening. The CJP said that the gigantic task of reforming the judiciary cannot be handled by him alone. He said this while addressing an event at the bar association later in the day. Addressing judges and lawyers later in the day, the CJP said that those who submit a genuine apology should be forgiven as it is the duty of judges to dispense justice. He also said that the judiciary should promptly react to the complaints about justice being delayed across the country. He said that the system needs fundamental changes to be fixed permanently. “I cannot make a law, I can only implement it,” he said. He also said that the SC cannot be expected to amend the laws that have been in place since 1861 and 1872. He praised the former SC judge Dost Mohammad Khan. Expressing displeasure at some bar members’ claims that Justice Dost was not given a full court reference, he explained the various instances when the senior judges attempted to give him a proper farewell but Justice Dost refused them for personal reasons.